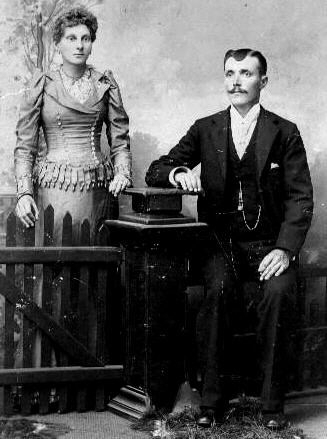 Hilda Gurina Larson (1874-1956) and Nels (1871-1933) were married in 1894 in Albert Lea, Freeborn County, Minnesota. Hilda was the daughter of Susannah Olsdatter and Svenning Larsson who immigrated from Aust-Agder, Norway. Nels was the son of Anders Gunnarsson Lien and Sigrid Andersdatter Eltun who immigrated from Vang, Oppland, Norway. Nels & Hilda had 8 children and later homesteaded in Burke County, North Dakota. They are buried at the Bethel Lutheran Cemetery outside of Powers Lake, North Dakota. Wow, this is so cool! You've actually got a picture of your great grandparents. How cool! It's one of the two pictures we have. Nels died before my mom was ever born, but I have more pictures of Hilda, who lived until my mother was 10. That is so cool. I Have my great grandparents wedding pics to. It's funny cause she was always laughing and smiling. In her wedding pic, she looks so serious. So cool that you have pictures, Dev!! LOL, feel so unreal!